Government of Nepal had introduced community forestry program since 3 and half decades and achieved to hand over the patches of forests to more than 18000 forest user groups. Almost, the forest in each VDCs are hand over as community forests. The major activities implied in the CF are protection and conservation of the forest to ensure the greenery and the stock of the forest. The rest of the forest at community access is the national forest governed by governmental authorities such as Department of forest. The forest stocks are overwhelmingly high and there is scope of getting forest products for the community basic requirements. The recent devastating earthquake hit in Nepal put the pressure on land by degrading the lands as well as damaging the local infrastructure including private buildings, small houses, animal sheds. This has increased the local demand of forest resources to reconstruct the buildings. The current discussion are being increased to get permission to cut the forest of Chure Environment Conservation Area however that option is not feasible in terms of product delivery as well as environmental perspective. 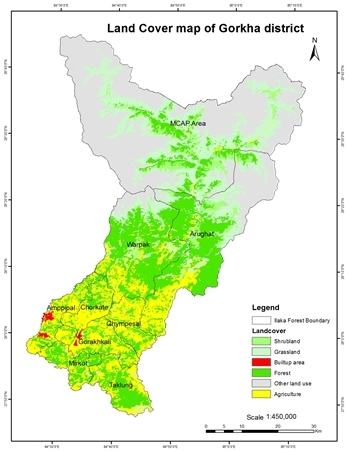 Thus, the aim of this study is to assess the resources available in the forests in locality taking the geospatial approach as the method of analysis. 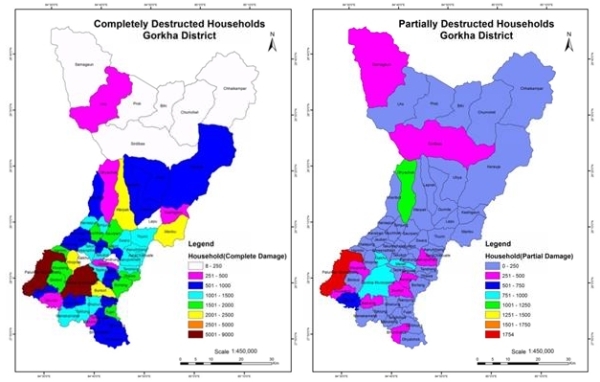 The study basically explored the resource available at local level which has spatial distributions differently at different geographic areas in Gorkha district where the epicenter lied. It will also see the cost and environmental significance of the resource delivery based on the transportation and other cost involved. This study tried to link the devastation due to earthquake, demand generated on forest resources and the resource availability in the locality. The geospatial approach has been adopted to see the potential delivery of the resources in the district. The analysis included the data available at different aspects such as forest coverage, distribution of the community forestry intervention in local administrative unit, prescription of district level timber extraction in CFs and the transportation opportunity in the district and vicinity villages. The study concludes with the recommendation to the resource managers and policy makers not to make the earthquake as a granted to cut the forest trees somewhere from the distant forest stand. The local forest in the vicinity can supply sufficient timber. The federal democratic republic of Nepal is located in between Tibetan (Chinese) and Indian plates and lies in a seismically active region. According to world record Nepal is 11th most earthquake-prone country. Historical data shows that first earthquake was recorded in 1255 AD in which King as well as one third population of Kathmandu valley was killed due to the tremor of earthquake. Similarly, Nepal has faced major shock in 1934 with 8.4magnitudes. Earthquakes have been causing several casualties damage in 1980, 1988 and 2011 AD (GoN, 2015). The recent tremor was felt on 25th April, 2015 firstly with the 7.6 magnitude and followed some major aftershocks on more than 6.0 magnitude and more than 400 aftershocks of 4.0 magnitudes in total and 29 aftershocks in Gorkha. As the main epicenter of this episode of the earthquake is Barpak village of Gorkha district,it is later known as the “Gorkha Earthquake”. The hypocenter of this earthquake was reported at the depth of approximately 8.2km (5.1 mile) from ground surface. This shock cause more than 8856 human casualties loss from all over the country with fully damaging 2673number of government buildings and 602257 numbers of private houses. Similarly partial damage by this shock was in the number of government buildings and private houses was 3,757 and 285,099 respectively (GoN, 2015). The occurrence of such earthquakes in Nepal caused great destruction in human life as well as in physical structures. This main shock is still followed by 400 numbers of aftershocks with local greater or equal to 4 magnitude until 15th October 2015 (Nepal seismology center) with the moving epicenters in neighboring districts Nuwakot, Rasuwa, Dhading, Sindhupalchowk, Dolakha. Thus, heavy destruction of human and physical infrastructure was on those districts. Two villages of Gorkha, Barpark and Laprak have been totally flattened out by devastating earthquake in April. While, people residing in Barpak and some other VDCs have initiated the reconstruction of their temporary houses and farm house by reusing available residue of timber, stone plates and zinc plates and other materials provided by Government and Non-government organizations as a relief materials. But many of houses from Laprak and other remote VDCs are still hopeful from government and non-governmental sectors for further help. On discussing reconstruction of physical structures there are different modalities to resume in its original state. One of them approved methodology by peoples society is by using community forest timber and reusing residue of initial state. Nepal has been practicing forest areas for special task operation at certain national emergency time. At the time of armed conflict period, which was started from 1996 to 2006 AD in Nepal both rebel and army group had used forest area for their specific purposes. Both of them ban for local FUG on entering and harvesting forest products and used for this for training operations, hiding purpose and barrack establishment. After peace process establishment in 2006; 31 thousands of People’s Liberation Army (PLA) of Communist Party Nepal (Maoist) was reestablished by building cantonment at different 7 areas, which was the land of national forest areas. Considering this approach and special law enforced in Forest Act 1993, Chapter 2- rule no 16 advocates on loose rule for government forest officers to collect and take out timber from the forest area at any time for its sale and distribution to victims of natural calamities. AAccording to Government of Nepal, Department of Forest decided that total 50 cft. timber will allocated for completely damaged private buildings and 20 cft. timber will allocated for partial damage of private buildings. Again in case of intuitional buildings 100 cft. will allocated for complete and 40 cft timber will allocated for partial damage. This analysis shows that there will total 7805560 cubic foot of timber is essential for reconstructing total damages of physical structures, which can also be calculated by following mathematic relation. The majorities of houses are made from mud-bonded and are of construction of bricks or stone (CBS, 2011). Again most of the houses damaged by earthquake seem on such damaging houses rather than Rod, Cement and Concrete. These raw materials for immediate re-establishment can be fulfilled from community forest products. Community forest is one of the potential sources for natural ecosystem services viz. timber and fuel wood and other by products etc. These ecosystem services are low cost as well as easily available from proximate areas. Again spatial determination of forest land use practices will highly crucial for scientific analysis of harvesting natural ecosystem services according to its potential. This analysis will further help on availability and effective economic assessment related to other common analysis. To recover from current disaster analysis of living situation of the people, reconstruction of the damaged structure and other parameters are very crucial. Construction of damaged private and social infrastructures require large amount of timber; which will directly affected by its availability and accessibility from forest land and other land use practices. So it is necessary to analyze the present growing stock of timber, demand in terms of proximities. 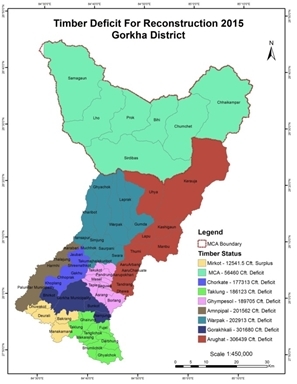 This paper tries to assess the current scenario of the stock and demand ratio with respect to reconstruction unit of timber from the point of view in different Ilaka of Gorkha district’s forest. Which ultimately try to examine the recent government decisions regarding the collection, sale and distribution of timber from Chure range. This will be a challenging issue with consideration of environmental degradation, due to fragile ecosystem of Chure forest. 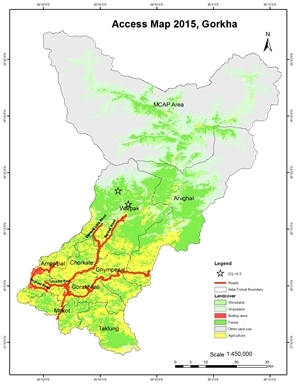 Overall objective of this research is to assure availability and its potentialities of Timber extraction and growing stock determination from all community forest of Gorkha districts, its spatial distribution analysis to mitigate local people in terms of timber demand for physical structures re establishing. Gorkha is one of the sixth districts from Gandaki Zone in Nepal’s Western Development Region. This district seems like as ladder form, which varies from geographical Mahabharat region to Alpine zone. It is bordered by Dhading district (Budhi Gandaki river) in east; Tanahun, Lamjung, Manang, (Chepe River) in west, Tibet of China in North and Tanahun and Chitwan district in South. Gorkha district has an area of 3610 sq.km, which area is fourth biggest district among 75 district of Nepal. Gorkha district varies from 228 meter to 2500 meter above mean sea level. It occupies in area between 84027’ to 85058’ latitude to 26015’ to 28015’ longitude. Gorkha is one of the high populated districts from Nepal with more than 271,000 populations. This is the district with first earthquake epicenter occurred in April 25th 2015 and one of the worst-affected districts among 14 district of Nepal. National record of government of Nepal shows that, up to September last 449 no of people were killed from this devastating disaster. The majority of houses from this district are made by mud-bonded and constructed of bricks or stone (GoN, 2011). Wood is the main sources of energy for cooking purposes in this district (CBS 2011). 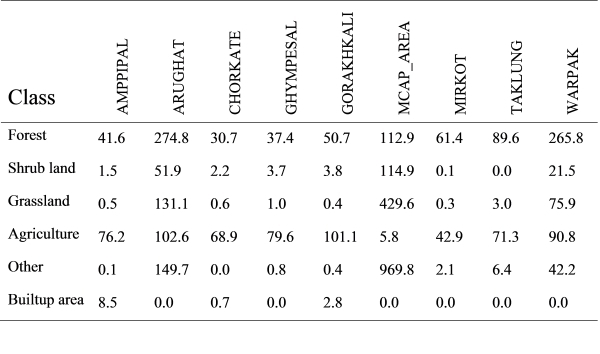 This study was based on both secondary data collection from different published and unpublished recent earthquake related articles by different NGO, INGO’s, Cabinet decision of GoN, Forest data from District forest office such as: Growing stock and Allowable cut, potentiality of timber production at community forest of Gorkha district and another was Spatial data relationship from forest land use of Gorkha district by using Arc GIS tool. Average demand of timber, allowable cut, average growing stock and other relationships were analyzed through Microsoft tool, other spatial relationship like demarcation, buffering, distance measurement were analyzed by ARC GIS 10. According to last census recorded by CBS Gorkha 2014, total household recorded in Gorkha district is with 66506 numbers with 271061 populations. But, According to DAO Gorkha total no of households are 76647 out of which total 63863 households has taken relief fund as primary compensation provided by Government of Nepal, after earthquake on April 25 (DAO 2015). Below table gives recent data with respect to household damage due to earthquake in different Ilaka and in MCAP area. This table shows that about 84 % of the infrastructures with in district get damaged by this sock on April 25, which was calculated by subtracting from total household and relief funds distributed for per household. 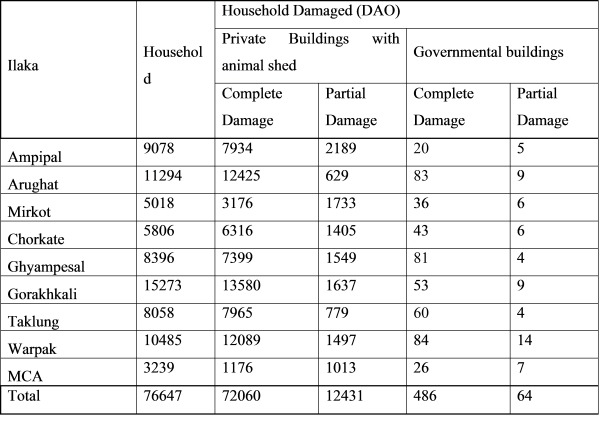 Given table also includes on private buildings as well as animal shed damaged altogether, which are also key needs to be reconstruct soon. Again Institutional infrastructure noted on governmental buildings present within the district. Table 2: Ilaka Wise Household and Damage. Above data shows that out of total 76,647 households present in overall district, total private buildings was destructed in 84,491 numbers, along with 550 in numbers of governmental building. These buildings were destructed in both fully and partially in condition. Almost 72060 numbers of complete damages was occurred in private buildings with 12431 numbers of partial damages. Similarly 486 numbers of Governmental buildings were completely get damaged and 64 buildings were again partially damaged. According to LRMP (1979), out of 361,470 Ha total area of the district 24.45% of area is covered by different types of forests i.e 88393 Ha. Manaslu conservation area covers all total 46.07% (166300 Ha.) of total area of Gorkha district. 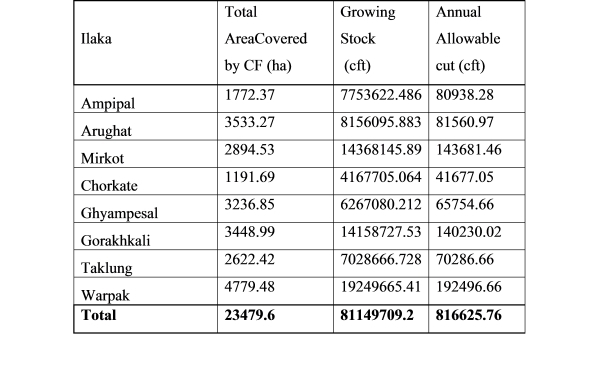 on calculating vegetation status all over the district, in Gorkha altogether there are 464 CFUGs presented with in district by covering 23364.33 ha land, government managed forest area is covered by 27752.23 ha area, and total 900.84 ha area is covered with leasehold forest, 30.79 ha land is covered with Religious Forest and 42.65 ha land is covered with Private forest. (DFO FYP 2071-2076). Following data presented in table is calculated according to analysis of 473 CF handed over to the community users up to 2015. These forest areas are further divided in 8 Ilaka forest by District Forest Office Gorkha for management perspective. Source: District Forest Office Gorkha 2015. AbAbove table shows that total community forest has ability of producing 81149709.2 cft timber per year in volume as growing stock. According to the Community forest Operational Guideline CFUG can extract timber up to 75% of annual growth from forest at good condition, similarly 60 % of extraction from medium forest and 40% of extraction from poor forest (Community Forestry Inventory Guideline 2061). But now only 50% of annual growth of timber is considered as allowable cut for Gorkha district by analyzing over all forest condition of the district. 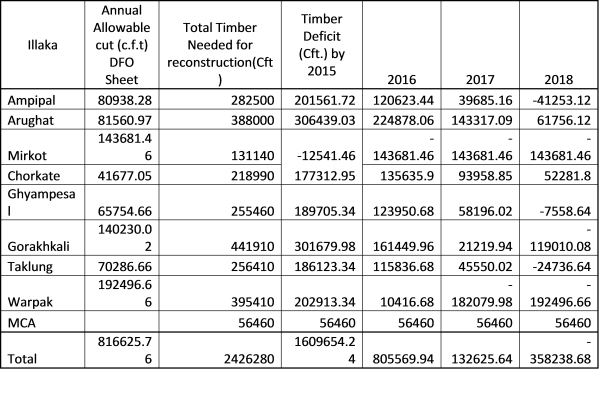 So, CFUG operational plans only permit for 816625.76 cft timber extraction per year from community forest of Gorkha district. Timer is considered as major constituent for reconstruction of buildings in remote areas buildings. So we consider as separate unit of timber for partial and complete damage of houses as well partial and complete damage of institutional buildings. In considering this Government of Nepal, Ministry of Forest and Soil Conservation, Department of Forest has prolonged a operational plan to reconstruct such physical structures, in this operational plan department has mentioned as 50 cft for complete damages houses and 20 cft for partial damages houses. Similarly for institutional buildings it has considered as 100cft for complete damages and 40 cft for partial damages. But according toinformation provided from District Forest Office Gorkha, Forest office can only provide 30 cft timbers for complete damage buildings and 20 cft timbers for partial damages buildings. 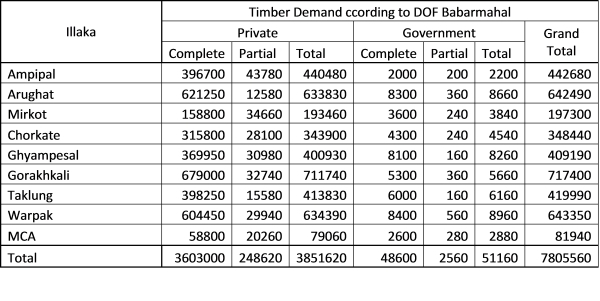 According to the decision made by of Department of Forest, average timber demand distribution on completely damaged buildings will preferred for 50 cft and 20 cft for partial damaged buildings. Again 100 cft will allocated for completely damaged governmental buildings and 40 cft timber for partially damaged governmental buildings. Scenario 2: This scenario 2nd speaks on distribution of timber for earthquake damaged private and governmental buildings and it’s overcome of demand in certain period of time, according to decision of District Forest Office Gorkha, Nepal. 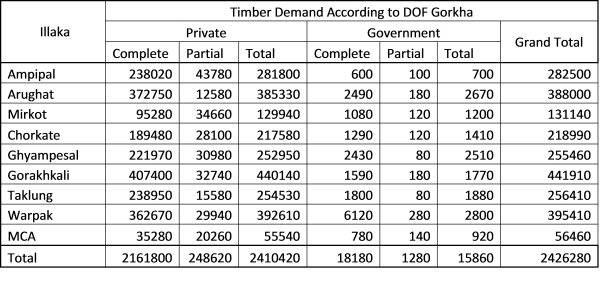 AcAccording to the decision made by of District Forest Office, average timber demand distribution on completely damaged private buildings will preferred for 30 cft and 20 cft for partial damaged buildings. Similar 30 cft timber will be allocated for completely damaged governmental buildings and 20 cft timber for partially damaged governmental buildings. Due to high demand of the timber in current year, each VDC of all Ilakas cannot get fulfill in this year except in Mirkot Ilaka Forest. So on calculating current timber demand, 3 times of allowable cut is recently needed for reconstruction of damaged buildings. Though reconstruction is desired in short period of time, it is also a long term process too; so completion of all damaged buildings may takes few more years. A realistic timeframe for the implementation of the earthquake recovery program is at least five to seven years (GoN, 2015). Gradually deficit will be recovered as the reconstruction time frame extends. In next 3 years the following deficit timber can be extracted from community forests to fulfill over all timber demand. On depending on Community Forest, no other sources are needed to fulfill the local demand if the reconstruction process is extended for few years. Timber deficit 2015 is calculated by subtracting the Annual allowable cut from total timber needed for reconstruction. 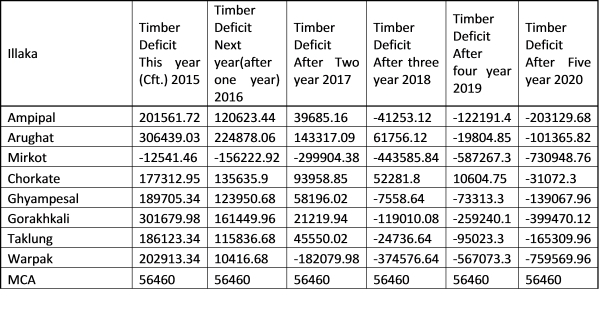 Timber deficit in 2016, 2017 and 2018 is calculated by subtracting the timber deficit from their respective previous year. The demand on Manaslu conservation can be fulfilled from Arughat and warpakillakas only. As Arughat has its own huge demand, supply from warpak is essential. Mirkot has its surplus from this year so it can be mobilized to adjoining illakas like Taklung, Anpipal, and Gorakhkali. Ampipal Ilaka can fulfill their demand by 2018, Arughat Illaka by 2019, Chorkate by 2020, Ghympesol,Gorakhkali and Taklung, by 2018,warpak by 2017with surplus 41253 cft,19804 cft, 143681 cft, 31072cft, 7558cft, 119010 cft, 24736 cft, 192496 cft respectively. In case of Mirkot Illaka, their demand this year is less than annual allowable cut so they can fulfill demand this year with surplus timber 12541.5 cft. And in Manaslu Conservation Area 56460 cft of timber must be fulfilled from other Illaka because we cannot harvest from this areas forest. In conclusion, the results from this study shows that the need of the timber supply for the reconstruction of buildings caused by earthquake 2015 can be fulfilled from the local sources of timber such as National forest, community forests and private forests in Gorkha. The enabling environment for the timber harvest and the transportation needed to be analyzed further. The sustainable harvest of the timber from the forest areas in the district can fullfil the local demand of the timber in Gorkha district within three years which ultimately the sustain the forest areas in the district as well as it will protect the environmentally important wood lots such as Chure region, if we have devised the proper plan of timber harvest linking with the nature of local demand of the timber viz. Urban people and rural people may have different need of the timber, people may not need entire demand of timber at the same time. The timber need may be categorized as of 3 months, 6 months, 1 year, 2 years and 3 years from the earthquake devastation. The other important management consideration should be the use of previous woods from the old building. Authors would like to acknowledge eG-Tech Pvt. Ltd. for necessary resources to conduct this study. We also want to acknowledge District Forest Office and District Administration Office, Gorkha for making necessary field data available. CBS (2014). District profile, Gorkha. DFO (2014). 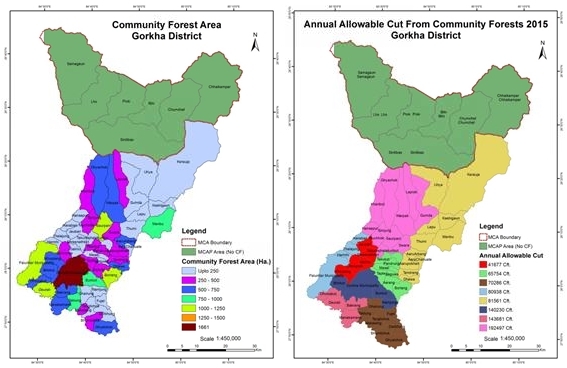 Five Year Forest Sector Plan of Gorkha District. pp 116. GoN (2015a). Nepal Earthquake 2015: Post Disaster Needs Assessment. Vol A: key Findings. pp 134. GoN (2015b). Nepal Earthquake 2015: Post Disaster Needs Assessment. Vol B: Sectors reports. pp 312. Paudel, G., Bishowokarma.,Paudel, N.S., (2015). Government decision on relaxing Chure Timber Supply to address post-earthquake reconstruction Demand: A sensible decision or just a gesture? pp 4. Hashemi, M., Alesheikh, A.A., (2011). A GIS-based earthquake damage assessment and settlement methodology. Soil Dynamics and Earthquake Engineering, V 31(11), pp1607-1617. Liu, J.G., Mason, P.J., Yu, E., Wu, M.C., Tang, C., Huang, R., Liu, H., (2012). GIS modeling of earthquake damage zones using satellite remote sensing and DEM data. Geomorphology, V 139-140(2012), 518-535. Hassanzadeh, R., Nedovic-Budic, Z., Razavi, A.A., Norouzzadeh, M., Hodhodkian, H., (2013). Interactive approach for GIS-based earthquake scenario development and resource estimation (Karmania hazard model). Computers and Geosciences, V 51(2013), pp 324-338. Bhattacharya, S., Hyodo, M., Goda, K., Tazoh, T., Taylor, C.A., (2011). Liquefaction of soil in the Tyoko Bay area from the 2011 Tohoku (Japan) earthquake. Soil Dynamics and Earthquake Engineering, V 31(11), pp 1618-1628. Dong, Yanfang., Li, Qi., Dou, Aixia., Wang, Xiaoqing., (2011). Extracting damages caused by the 2008 Ms 8.0 Wenchuan earthquake from SAR remote sensing data. Journal of Asian Earth Sciences, V 40(4), pp 907-914. Erdik, M., Sesetyan, K., Demircioglu, M.B., Hancilar, U., Zulfikar., (2011). Rapid earthquake loss assessment after damaging earthquakes. Soil Dynamics and Earthquake Engineering, V 31(2), pp 247-266. Liu, Huan., Cui, Ximin., Yuan, D., Wang, Z., Jin, J., Wang, M., (2011). Study of Earthquake isaster Population Risk Based on GIS. Procedia Enviromental Sciences, V 11(2011), pp 1084-1091. Dr. Him Lal Shrestha holds a PhD degree from Kathmandu University (KU) and is currently working with Ministry of Population and Environment, as a Natural Ecosystem Restoration Specialist under EBA South Project, Nepal. His current research focuses on the geospatial approach in Forestry and Natural Resource Management, Geospatial approach for REDD and MRV, land use land cover mapping and analysis, Geodatabase management and Web mapping. Mr. Nawaraj Chapagain is currently a PhD Scholar in Kathmandu University. He has a close interest on the local requirement of the resource for the reconstruction of the earth quake victims. Mr. Krishna Ram Dhital holds a Bachelor degree in forestry from Tribhuvan University, Nepal. Currently, he is working with eG-Tech Pvt. Ltd. as a Research Officer. Mr. Sujan Adhikari holds a Bachelor degree in forestry from Tribhuvan University, Nepal. Currently, he is working with eG-Tech Pvt. Ltd. as a Research Officer.